Firstly, please familiarise yourself with the basics of torrenting and peer-to-peer file sharing. A good beginners guide can be found here. This guide will use the utorrent client which can be downloaded from here. Other clients are available, but this is the one I recommend for PC based torrenting. The same theory should apply to most clients anyway. 1. The first thing to do is ensure that you have the show you wish to torrent in a directory on your hard disk. These are the files that we will make the torrent from. These files should be in the same location as your default download directory in utorrent. Eg. in utorrent, if you look in Options -> Preferences -> Downloads, you will see a Put New Downloads In: option. Set this to where you want to save your downloads, and place anything you want to upload in this directory too. 2. Start the torrent client on your PC. In this case, I am using the utorrent client. 3. From the File menu, select Create New Torrent. 5. Ensure that the URL 'http://torrent.genesis-movement.org/announce.php' is in the Trackers field. 6. Click the Create And Save As.. button. 8. Ensure that you are logged in to the site. New users will need to register. 9. At the top of the screen, you will see the words Upload Torrent. Click on that link. 9. 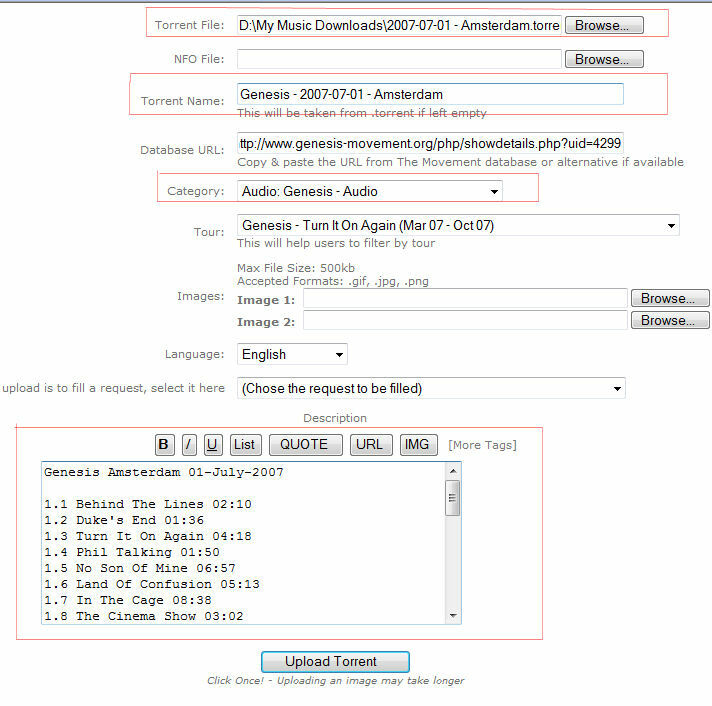 The Upload A Torrent page will now be displayed. Before you upload, it is essential that you read and understand the upload rules. Fill in each of the fields with the information required. You must fill in the fields marked by red boxes in the picture below. Failure to do so will mean that your torrent will probably be removed. - A Torrent Name IS required. This will be the name shown in the torrents list, so make it meaningful! 10. Click on Upload Torrent. Your .torrent file will now be uploaded and you will see the following screen. Browse to your newly saved .torrent file and open it. Your client will now go through a process of Checking Existing Data. This ensures the integrity of the files to be torrented. Once that is complete, you will see your torrent being seeded. You will not see your torrent listed on the site until you start seeding. Initially, the torrent may be in red as it is being seeded, but has no leechers. You can now go back to the torrent site, refresh the page and you should see your torrent in the list. Click on your torrent and click on the [Show] link next to the word Peers. You will see that you are the only Seeder. If all has worked to plan, after a few minutes people should start to download your torrent and you will see your torrent change colour in your client and you will see your download speed. In this case, it has now turned blue and the upload speed is showing as uploading. You are now seeding a torrent!